My favourite pastime while in Mumbai apart from introducing amazing bugs in existing software applications of my project was swatting mosquitoes.However offensive it may sound to the Mosquito community and its a very strong one let me tell you,it gave me an uncanny pleasure to see the smashed carcass of this extremely dangerous animal plastered against the light creamish or maybe offwhitish background of a not so dirty wall. I share this fascination with quite a few world leaders such as our very own Mahatma Gandhi who was the worst affected primarily because of his aversion to anything remotely familiar with cloth. Classified files (mostly leaked) say that what people later came to know as the Dandi march was actually initiated by one such mosquito bite on a cold wintry night which so infuriated the elderly gentleman that he thought of taking a fast and spending his remaining life in the Arabian Sea with whales and jelly fishes and had infact set out from his Ashram to this effect.People joined him in his protest and as it always happens in India where plans never work out,they ended up making salt instead. Richard Nixon was perennially harrassed by a specially trained female Cuban biter of XXIVth Bay of Pigs Squadron.In her biography named "Water through those Gates" ,she writes of her fascination for the President's soft bottom and unhygeinic habits of leaving his litter uncleaned.Though Gerald Ford who succeeded Nixon pardoned him for all his offences, one particular female of the Culex genera could never forgive him for prematurely vacating the White House washrooms as she took an oath of never falling for any US President's bottom ever.The last we heard, was that she was ceremoniously discharged of her sevices,decorated with the Iron Cross by Fidel Castro himself.She leads a quiet life today teaching the younger generation from her new book titled "Ek Choti Si Love Story",which I have learnt has been made into a highly unacclaimed and very unsuccessful film in India with the same title. Every organism has some part to play in the bio ecological system of Nature or so I thought.Thus after spending a particularly painful hour plucking out nostril hairs on a very mundane Saturday evening ,when I was presented with an interview slot with the extremely busy and well decorated Mosquito General Mr.T in charge of Extremely smelly Armpits and waxy Earlobes infantry division Thane Shakha, I was naturally thrilled. Having never had the honour of interviewing a defense personal before,I was naturally apprehensive and arrived sharp on time as scheduled at 6:24 p.m. behind the Kitchen door ,underneath the wet mopper ,within the third hole from the top of my once discarded and profusely smelly brown socks. Me : "Ahem ,Mr T Good Evening,Honoured to meet you Sir"
Mr T : "Aha Mr.Dasgupta a very Good evening to you,so how has your left armpit been doing of late? I hope my men are taking good care of it "
Me : "Indeed Sir.I had a particularly big pinkish inflammation yesterday evening caused by two of your men's bites ....er...expeditions...you know.... Are you by any chance using stronger toxins and anticoagulants these days ?" Mr T: "Oh yes we recently recieved the best quality ones from the drains of Khiddirpore you know ....Its tough to get the undiluted ones these days...(Sighs)...A lot of corruption has come within our ranks as well...Its only day before that one of our colonels from the Andheri Brigade was drain marshalled after he was caught red handed sleeping on a Good Night mattress...."
Me : "Oh what a shame.Sir would you like to tell me something about your illustrious career spanning a long 22 days "
Mr T : "Its funny you know , when I look back on my larvaehood days.My mother used to regale me with stories of how I was brilliantly conceived on a particularly moist neck of a Pao Bhaji seller within the vendors compartment of the 6:49 Virar local packed with a total count of 33251 types of animal species.My father seems to have heroically flown over furious rivulets of hot steamy sweat and managed to seduce my mother just as the train crossed the Dharavi slums"
Me : "Oh how fascinating,it must have been for your mother"
Mr T : "Yes (Sighs)... she was a brave Mosquito.I decided to join the defense forces the day I was born alongwith my twenty three thousand five hundred and fifty two other brothers and sisters." Me : "Oh how chivalrous of you, and I hear that you soon rose very swiftly in the ranks courtesy that amazing proboscis of yours which can even penetrate the thick skinned Patels of Dalal Street...Is it true Sir ?" Mr T : " Oh ...(smiles and some blushing)..."
Me :" Sir any particular reason to choose my flat as your bastion now ..Of course you are most welcome Sir ..but was naturally curious as regards my good deeds of my previous birth to have earned such an honour "
Mr T " Oh no not at all..on the contary the honour is all mine Mr.Dasgupta..Where else could we find such a rich natural source of continuos carbon dioxide,lactic acid and vegetation than within those immensely fertile armpits of yours"
Me : " Ahem ..Er...Sir, what are those medals for that you are wearing?" Mr T : "(Smiles and more blushing)...This red one here is a personal favourite you know.I got it for blood sucking the entire Agarwalla family of Flat 102 Block C and the other one you see here is also special as Mr Chinchpokli was very drunk that night and the liquor had begun to get on to my head after the first two bites.However I carried on bravely and managed three more bites....I did bang myself nastily against his huge tummy....he he ....Ah....those bygone days ...........Anyway Mr.Dasgupta ,it has been a real pleasure sharing these special moments with you ,but I must take your leave now as I have to conduct a Special Green Belt Certification program on " The terrains of a Bihari wasteline: Risks and Mitigation plans "
Mr T bowed and flew down to the pool of the stagnating dog pee in the first floor steps where this certification program was to be held. I switched on my TV and lay back with a sense of complete satisfaction. 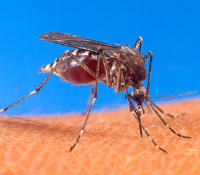 I had just realised that Project Managers among mosquitoes too actually do nothing and they share the same Family name with all other PMs of every other species known to mankind. happen 2 c ur post jus now..
just remembered the song : "Ek Machchad.. Aadmi ko.."
@Sridhar -Mosquitoes always ignite the thought process...amazing creatures they are isnt it ? @Satyakam - You dirty mind.!!! story #2 poultry farmers was damn funny. its amazing how someone can dedicate so much of energy and time,not to mention uncountable other resources, on a miniscule creature like MOSQUI... kudos to u! !